feel about visiting the dentist! ease during your dental visits! Have you ever made an appointment to see the dentist but cancelled it because you felt anxious? Maybe you just didn’t show up for the appointment. The problem with not getting regular dental check ups is you can encounter serious problems later on. You may even be in pain right now! At Salt Lake Dental Care, we do not want you to be in pain, especially if you have dental phobia. We welcome you to our comfortable Murray, UT office and offer you a solution, so you can stop feeling dental phobia. The solution? 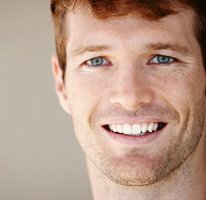 Sedation dentist Dr. Clint Blackwood offers sedation dentistry for the Salt Lake City area, including West Jordan and Sandy Utah. Sedation dentistry is a method of administering medication from your sedation dentist. This medication will help you relax during your visits with us. Sedation dentistry treatments aren’t meant to make you sleep, though you may feel drowsy. The sedation dentist helps you conquer dental fears because you are not as stimulated by what is going on. In other words, you are awake and aware but may not be as bothered or anxious as you normally would be. Laughing Gas | You’ve probably heard of laughing gas, but this sedation method really isn’t designed to make you laugh. It helps you feel relaxed in order to alleviate your dental phobia. The gas is mixed with oxygen, and you breathe it in to feel its effects. This sedation dentistry method works quickly, so you can drive to and from your appointment. It is a time-tested method and has few, if any, side effects. ORAL CONSCIOUS SEDATION | This is a big term for a small yet highly effective sedation dentistry method. Your sedation dentist will give you a pill to take prior to your next appointment. You will feel woozy but aware. You will need to find transportation to and from your appointment. IV SEDATION | Your sedation dentist will put medicine into an IV. This IV sedation dentistry medicine is designed to keep you relaxed during your procedure. Dr. Blackwood will make sure you have the right amount of medication, so you will stay at an appropriate level of relaxation. Besides feeling more relaxed and not feeling dental anxiety during your visits with us, your sedation dentist is often able to perform more than one procedure, which saves you time. Our sedation dentistry patients have also reported that they feel little to no pain at all. This is because you are more sensitive to pain when you are anxious. Take away the anxiety, and you may take away the pain, too! Call sedation dentist Dr. Blackwood today, and let us partner with you. You no longer have to be afraid to receive dental treatments. For a full list of services available at Salt Lake Dental Care, please visit our main website!